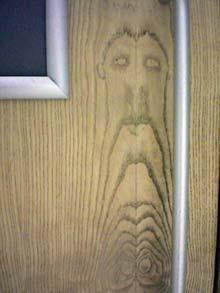 Colleague A agreed that that ‘face’ in the door looked very Jesus-like, but Colleague B thought that it resembled an Orangutan. I watched their conversation on my Facebook page with great amusement and suggested that this might well be a physical manifestation of the Jesus-monkey (based on evidence in Mark chapter two which states that Jesus tied a tyre to a tree and unpeeled a banana with his toes). Colleague B is currently involved in the production of electronic transcriptions of biblical manuscripts and so, with this in mind, Colleague A pointed out to Colleague B that she is sitting on the opportunity of a lifetime. Photoshop. Maybe at some point in her work, Colleague B could, with a surreptitious click of the mouse, slip a reference to a Jesus-monkey into the manuscript that she is working on and we could sit back and watch the academics scratching their heads when the final transcription is published. And why stop there? Imagine the fun that could be had! Jesus rode into Jerusalem on a drunk Llama, the three kings could become three gangster rappers, hamburgers and lager at the Last Supper (Tizer for Judas, of course). Hours of fun. And not only could we edit the existing text, we could also insert and remove material to suit our own particular causes or beliefs. I’m sure that The Geek Muse revised version of the Ten Commandments would be very…ermm…interesting! Unfortunately, no matter how many chocolate cookies or neck massages are bestowed upon her, my co-worker is resisting our mischievous attempts to corrupt her research and cause mass outrage in the religious communities, so we can only dream of the chaos and hysteria that could have been. But here’s the question that I’ve been asking everyone since this whole conversation started: If you could Photoshop an ancient manuscript of the Bible, bury it, ‘discover’ it in a few years time and have it accepted as THE authoritative text, what material would you insert or remove and/or which verses would you edit? I've been giving this matter a bit of thought, and, well, speaking as a child of the 70s, for starters, I'd quite like to see Jesus make the disciples into Fisher Price men instead of fishers of men, and I think the four Daleks of the apocalypse would sound much scarier than horsemen. Who's frightened of Harvey Smith? Perhaps also please insert a verse somewhere around John 13/14 saying, 'And lo, Mary Magdelene was neither present at the last supper nor married to Jesus'. ‎"The man whom you gave me to be with him, he gave me, and I ate."